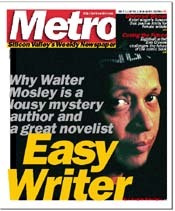 For African American mystery writer Walter Mosley the mystery of his own success is beyond words. The success industry cashes in on Silicon Valley's spiritual hunger. Scrabble Rousing: Serious fun for board people. Public Eye: Dialing for Dollars. Polis Report: The truth about pot and death. Godard Lives--Maybe: The traveling Ann Arbor Experimental Film Festival makes a pit stop at Foothill College. Belfast Boys: It's everyone's fault in Thaddeus O'Sullivan's Nothing Personal. High-Grade Pulp: Rough Magic revives a tired genre. The Lion Roars Again: Sinead O'Connor's anger and skills are undimmed on her new release, Gospel Oaks. Doubt It: No Doubt sinks to the age of its audience at Shoreline concert. Beat Street: Sleater-Kinney outstrips its critical raves. Old World Ways: Sicilian traditions rule at Cupertino's Mondello restaurant. Bargain Bites: TC Tea brews dozens of elixirs--hot and cold, sweet and tart, delicate and full-bodied. Overdue Billiard: Dan Clowes predicts the end of adult comics. Or is it only the beginning? Earthy Comedy: Two women discover common ground in San Jose Stage Company's Grace and Glorie. 'Sisters' Reborn: An old opera is made new again in the region's newest venue. Lipstick Tracers: Three MACLA artists pinpoint changes in spiritual and gender landscape.